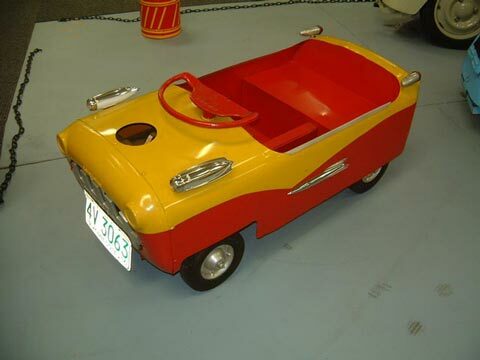 The 1953-55 Child's Sport Car used the same smaller single-seat bodyshell as the Sport Car, but did not have lights. The motor was the smaller 2hp #6 Briggs & Stratton, and there was a hand throttle only, within easy reach of a nearby adult. Colors were red, yellow and blue, with 2-tones available. This car has the rockets as well as a full set of period flashlight-battery bicycle lamps.